Inventory shrinkage breaks down to this: something that should be there isn't there anymore. Shrinkage cost the global retail industry more than $112 billion last year, which amounts to almost 1.4% of annual sales. This can happen for many reasons, including expirations, human error, damage and misplacement, but the biggest threat of all is theft (both employee theft and shoplifting). Shoplifting happens to small businesses just as easily as the big guys, but the difference is that 2% loss makes a much more serious impact on a small business. Prevention is best, so we rounded up a few ways to fight those bad apples, prevent shoplifting and keep your inventory safe. 1. 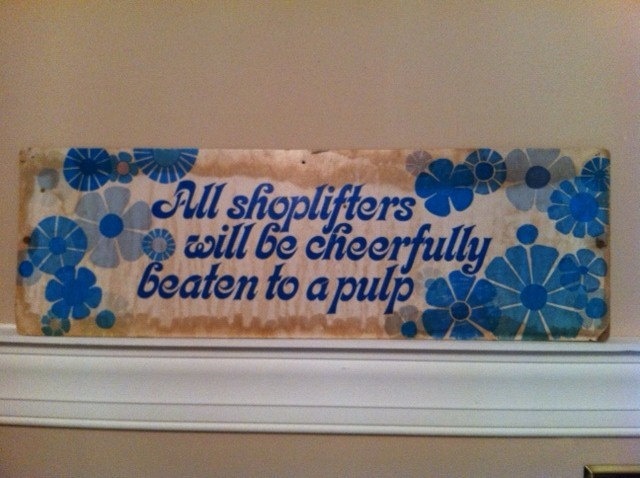 Design your shop with shoplifters in mind. Don't display pricey items near the door. Utilize mirrors to see around corners. Avoid creating "blind spots" with shelving and layout. Keep the shop organized so that you will recognize right away when something is missing. 2. Walk around. Engage. Make eye contact. This applies for customer service too, but simply be attentive. Don't be afraid to leave your assistant manager behind the register while you help a customer find what they need. 3. Recognize the signs. Thanks to Winona Ryder, we know that profiling a shoplifter is not going to work. Anybody (even a famous celebrity) has the potential to shoplift. And the majority of shoplifters are not so brazen that they just grab a big screen TV and run off. It's best to look for subtle things like anxious movements, big and baggy clothing (or unseasonable jackets), dressing room heists, customers who make frequent returns without a receipt, strollers without a baby, shopping bags that look old or aren't from nearby stores, umbrellas on sunny days, hangers and price tags on the floor, etc. 4. Understand how shoplifters will steal from your store. Basically, take note of the chinks in your armor when it comes to your layout and your inventory and take extra care in those areas. If you sell shoes, for example, make sure you confirm that the shoes in the box are the shoes on the box (and that there are no little surprises in the box or the shoes themselves). Or if you have only one shopkeeper working at a time, a shoplifter may ask for you to check if something is in stock and then walk out with something while you're in the back room digging around. Do you sell any of the most commonly stolen items like cigarettes, small electronics or designer clothing? You might need to shore up your defenses even more than the average retail business owner. 5. Have a plan in place for when you catch someone red-handed. Nothing is worse than spotting a shoplifter and then doing nothing out of fear or intimidation. Do you have a zero tolerance policy? What will you do if the shoplifter is under 18? How will your employees discreetly notify you of the situation in the moment? Create a protocol for you and your employees based on the laws and policies in your area. 6. Don't let suspicion rule you. Yes, shoplifting is a real problem, but treating your customers like criminals isn't going to do anyone any favors either. Have any crime-fighting tips for dealing with shoplifters? Let us know in the comments!